Combining high-resolution optics and stylish, streamlined bodies with outstanding cost performance, the 8x25UCF XII, 10x25UCF XII, 12x25 UCF XII and 16x25 UCF XII offer excellent image quality and viewing comfort for most general-purpose applications, including wildlife, sports and theatrical observations. 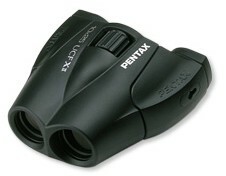 The new UCF XII-series feature the PENTAX-original dual-axis eye-distance adjustment system to assure precise alignment of the lens barrels. Coupled with large 25mm objective lenses, high-refraction BaK4 glass prisms, multi-coated optical elements and aspherical eyepiece lens elements, they deliver high-quality images even under poor viewing conditions.? Their compact, lightweight bodies are protected against dust and shock by full-body rubber housing.? Other user-friendly features include a long 15-millimeter eye relief, a short minimum focusing distance of 1.9 meters/6.2 feet, extendible eyepiece rings, a fully retractable pop-up diopter adjuster, and a tripod socket.? Real field of view: 6.2? 5.0? 4.2? 3.1? Apparent field of view: 50? 50? 50? 50? Field of view at 1000 yard: 324 ft. 261 ft. 219 ft. 162 ft.